Ecclesiasticus is a religious work, written in Hebrew in the second century BCE by the Jewish scribe Jesus ben Sirach. Although it was not accepted into the Hebrew Bible and the original version is lost, its Greek translation is found in the Septuagint. 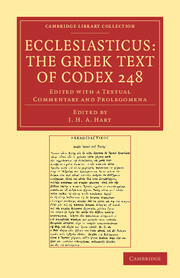 The focus of this study by Cambridge scholar J. H. A. Hart (1876?1952) is on the Greek text of Ecclesiasticus from a fourteenth-century codex, written in a miniscule cursive hand. First published in 1909, the book contains the text in transcription, based on the work of Charles Taylor, who had previously published a study of the text. Hart next investigates its relationship to surviving fragments of the Hebrew version, and the results of his research are included in his textual commentary. He provides a thorough analysis of the Greek translator's prologue and compares variant Greek versions of the work. Hart's edition remains of use to biblical scholars today. Preface, List of abbreviations, Authorities, The second prologue, The text of Ecclesiasticus according to Codex 248 (Cod. Vat. Gr. 347), Appendix, being Collation of the Syro-Hexaplar with the text of Codex Vaticanus, Textual commentary, being a collection of Hebrew, Syriac, Greek and Latin variations from the text of Codex Vaticanus with some parallels from the Septuagint and illustrations, Prolegomena, 1. The prologue of the Greek translator, 2. The Pharisaic recension of the Wisdom of Ben Sira, 3. The quotations of Clement of Alexandria, 4. The conflict of the rival Greek versions, Indexes to the Prolegomena.